By Aragon Garcia: Top Rank promoter Bob Arum says he’s going to have Teofimo Lopez target the WBC lightweight, and then match him against Vasyl Lomachenko (12-1, 9 KOs) in 2020 in a unification fight. Arum expects the current WBC 135 lb champion Mikey Garcia to vacate the belt after he moves up in weight to challenger IBF welterweight champion Errol Spence Jr. on March 16. With the WBC lightweight belt going vacant, Lopez and Lomachenko will converge on it and fight it out for the title next year, if Arum has his way. Arum doesn’t want the Lomachenko vs. Lopez fight this year for some reason. Top Rank are currently looking for an opponent for the 21-year-old Teofimo to fight on the undercard of the Terence Crawford vs. Amir Khan card on ESPN pay-per-view at Madison Square Garden in New York. Arum says it WON’T be former two division world champion Jose Pedraza that will be facing Lopez on the Crawford-Khan card on April 20. He’s lookig for someone else. Arum sees it as a being a big problem for Mikey if he decides to move back down to lightweight to defend the belt against Lomachenko or Teofimo Lopez (12-0, 9 KOs). Arum sees the WBC wanting to plan for the future by making a decision to have Lomachenko and Lopez be the ones that fight for their WBC lightweight belt after Mikey vacates. If Mikey doesn’t vacate the belt, it wouldn’t be surprising if the WBC gives him an Emeritus tag, so that Lopez can fight Lomachenko for it. The fight Arum is interested in putting together a fight between #11 WBC Lopez and #1 Luke Campbell (19-2, 15 KOs). This would be a match that could potentially have the interim WBC lightweight title on the line, as long as World Boxing Council president Mauricio Sulaiman is accommodating. Lopez vs. Campbell would be a tricky one to put together, since Campbell is signed with Matchroom Boxing promoter Eddie Hearn, and he fights on DAZN. Putting together a fight between the Top Rank promoted Lopez and Campbell will need some serious negotiations by Arum and Hearn. It can be done though. As long as the WBC makes it worthwhile for Lopez to face Pedraza, it’s a doable fight. Lopez vs. Campbell will be a good fight. Campbell is a 2008 Olympic gold medalist from the UK, who has always looked good in his fights, even in the ones that he’s lost. Arum wants the Lopez vs. Pedraza (25-2, 12 KOs) to take place in the summer, but not in Lopez’s name fight on April 20. It would be interesting to see who Arum can get for Lopez to fight on that card. The better the opponent for the young Lopez the more pay-per-view buys the card will bring in on ESPN PPV. It needs to be an upgrade from Teofimo’s last opponent former world title challenger Diego Magdaleno (31-3, 13 KOs), who he knocked out in the seventh round last Saturday night on ESPN+ at The Ford Center at The Star, in Frisco, Texas. Lopez admitted after the fight that he’d carried the 32-year-old Magdaleno to get him to the seventh round, at which point he knocked him out after hitting him with two left hooks. Lopez was criticized by boxing fan after the fight for the way that he ran up to Magdaleno while he was still down in the 7th and made a shoveling motion, as if he was throw dirt on him to bury him. Arum isn’t giving any hints about who he’s looking to get to match against Lopez on April 20. There are a lot of contenders in the lightweight division for Arum to pick from, but most of them aren’t all that talented. Arum promotes former WBO lightweight champion Raymundo Beltran (35-8-1, 21 KOs), but he’s coming off of a one-sided 12 round unanimous decision loss to Pedraza last August. Beltran is fighting unbeaten Hiroki Okada (19-0, 13 KOs) this Sunday on the Jose Ramirez vs. Jose Zepeda card on February 10 on ESPN and ESPN Deportes at the Save Mart Center in Fresno, California. Beltran, 37, might lose that fight. 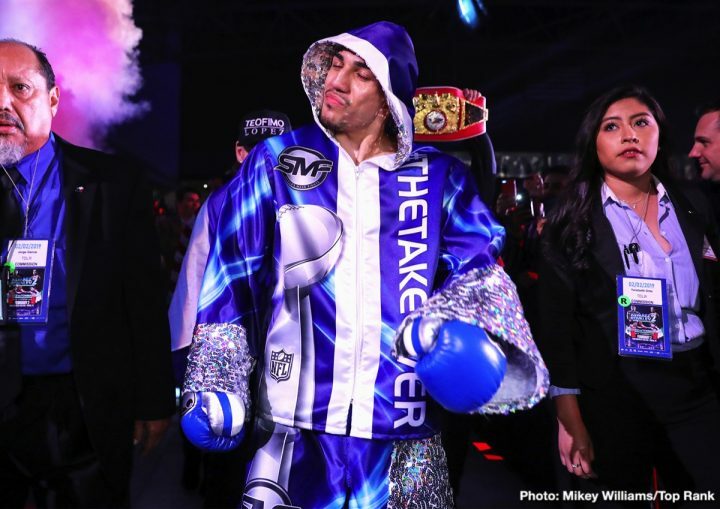 But even if he wins, he’s likely going to be cut up, and he won’t be able to get back in the ring to train for a fight against Lopez on April 20. Arum would be better off finding picking one of these guys for Lopez to fight: Yvan Mendy, Javier Fortuna, Jorge Linares, Roman Andreev, Emiliano Marsili or Daud Cino Yordan. There are some good guys for Top Rank Boxing to try and get for Lopez to fight on April 20. It’s important that Top Rank finds someone good for Lopez to fight for the card, because this is going to be on ESPN PPV. The main event between Terence Crawford and Amir Khan might not be as appealing to the masses as Arum thinks it’ll be. He was talking about ESPN having a far reach in attracting interest in the Crawford vs. Khan card, but he might be wrong. Crawford’s only effort fighting on PPV was three years ago against Viktor Postol, and that fight drew only 50,000 buys. Arum thinks things will be different with Crawford fighting on ESPN now, but nothing has changed as far as his lack of popularity. That’s not going to change no matter what network Crawford is fighting on. Khan isn’t popular, and he’s not going to suddenly become popular by April 20 just because ESPN will be trying to market the fight. Teofimo Lopez is more important than Arum might realize for the Crawford-Khan card. Lopez might be the guy that ends up attracting all the PPV buys. It’s hard to imagine the casual boxing fans wanting to pay to see Crawford beat up Khan. That’s a mismatch, and Crawford has a lazy style of fighting that is sometimes less than crowd pleasing. Having Lopez on the Crawford vs. Khan card on April 20 could result in a lot of boxing fan purchasing the card. It’ll help if Arum [picks put a good opponent for Lopez to fight instead of putting him in with another over-matched opponent like the one he beat last Saturday night. If Arum need to look at other weight classes in order to try and find a good opponent for Lopez to fight, then he should do so. There are a lot of good guys for Lopez to fight from the 140 lb division on April 20, but not so many for him to take on from the 135 lb weight class unfortunately. Arum needs to be willing to look to other weight classes to try and find a good opponent for Lopez to fight on the 20th of April fight date. Matchroom promoter Hearn should think hard before he lets Campbell fight a monster puncher like Teofimo Lopez. That fight has knockout written all over it for Lopez. Campbell is a good fighter. He’s capable of winning a world title one of these days once Lomachenko and Lopez are out of the picture. Hearn can make Campbell’s life much easier if he has him swerve Lopez, and go after a title at 140 or 130, if he can comfortably make weight for that division. Lopez-Campbell is a good fight, but it’s probably going to be an easy win for Lopez. Lomachenko should try and get the fight with Lopez this year instead of waiting until next year. The longer fight takes, the more likely Lomachenko gets bludgeoned into submission by Lopez. Lomachenko is an old 30.